We study the dynamics of oscillating nanomenisci anchored on nanometric topographical defects around a cylindrical nanofiber with a radius below 100 nm. Using frequency-modulation atomic force microscopy (FM-AFM), we show that the friction coefficient surges as the contact angle is decreased. We propose a theoretical model within the lubrification approximation that reproduces the experimental data and provides a comprehensive description of the dynamics of the nanomeniscus. The dissipation pattern in the vicinity of the contact line and the anchoring properties are discussed as a function of liquid and surface properties in addition to the forcing conditions. Does the shape of a liquid droplet only depend on the interactions with the topmost atoms of the substrate or do the underlying atoms also play some role ? 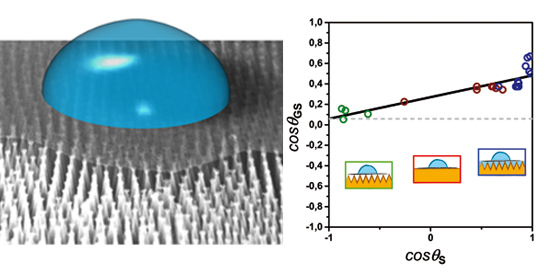 In collaboration with colleagues from the Brookhaven National Lab (USA) we brought a quantitative answer by investigating the wetting properties of a graphene monolayer suspended on silicon surfaces bearing nanopillars. The precise control over the nanopillar profile allows us to vary the area fraction of suspended graphene from 0% to 95% which is used to effectively “tune” the liquid-substrate interactions. We could quantify that ca. 80% of the long-range water-substrate interactions are screened by the graphene monolayer. 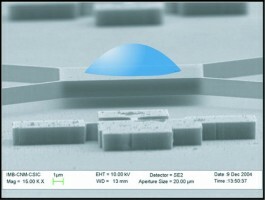 Three AFM techniques werere combined to investigate hydrodynamics around micro- and nanofibers. Confronting the experimental findings to a classical theoretical model reveals the potential of AFM for quantitative measurement of dissipation processes at the sub-micron scale. We investigate the shape and mechanical properties of liquid interfaces down to nanometer scale by atomic force microscopy (AFM) and scanning electron microscopy (SEM). In both cases, the interface is probed with a cylindrical nanofiber with radius of the order of 25-100 nm. The effective spring constant of the nanomeniscus is determined by frequency-modulation FM-AFM modes in unbounded or confined situations. It shows that the lateral size of the meniscus strongly influences the effective spring constant. 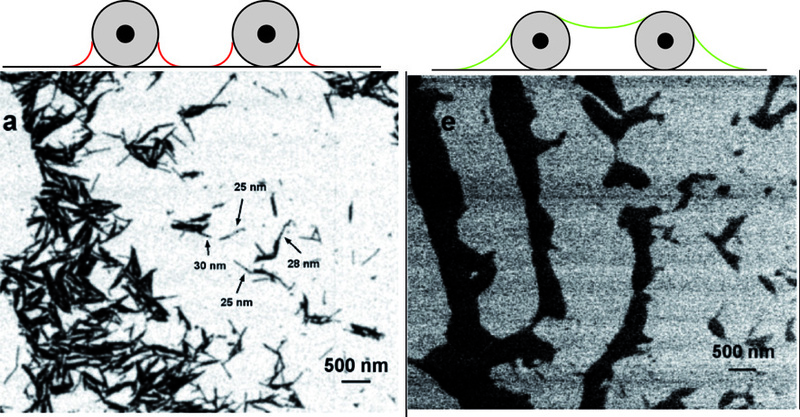 Electron microscopy allowed to visualize the meniscus profile around the fiber with a lateral resolution of the order of 10 nm and confirmed its catenary shape. Using non conventional AFM tips equipped with a carbon nanocone, we were able to investigate the pinning of the contact line on individual nanometric defects and demonstrated the existence of two types of defects (weak and strong). The extension of these studies in dynamic FM-AFM mode is currently underway. By its ability to manipulate ultrasmall liquid volumes (aL to fL), the NADIS technique is a useful tool to preform original wetting experiments at sub-micron scale. The size of spots as a function of tip contact time or speed allows to study the dynamics of spreading at sub-micron range and millisecond timescale. The measured R t1/4 power law can be interpreted by assuming a spreading under constant pressure condition. 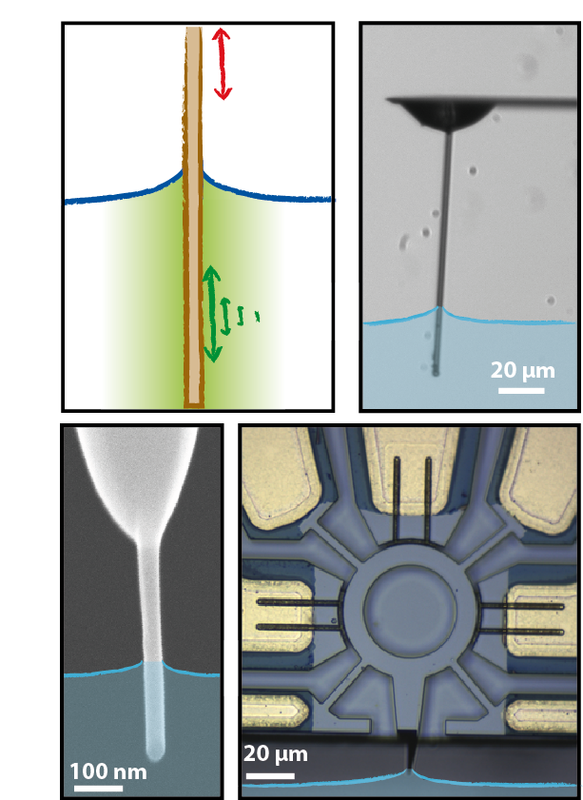 The controlled deposition of droplets by NADIS on ultrasensitive mass sensors allowed us to study the evaporation of “femtodroplets” of glycerol which could be interpreted using a macroscopic constant contact angle model. the basis for all biology. We captured the formation of submicrometer water droplets and filaments on single viral particles. The condensate structures are compatible with capillary condensation between adsorbed virus particlesand with known droplet shapes on patterned surfaces. Dissipation in an oscillating nanomeniscus, C. Mortagne, K. Lippera, P. Tordjeman, M. Benzaquen and T. Ondarçuhu,Phys. Rev. Fluids. Rapid Comm., 2 (2017) 102201(R). 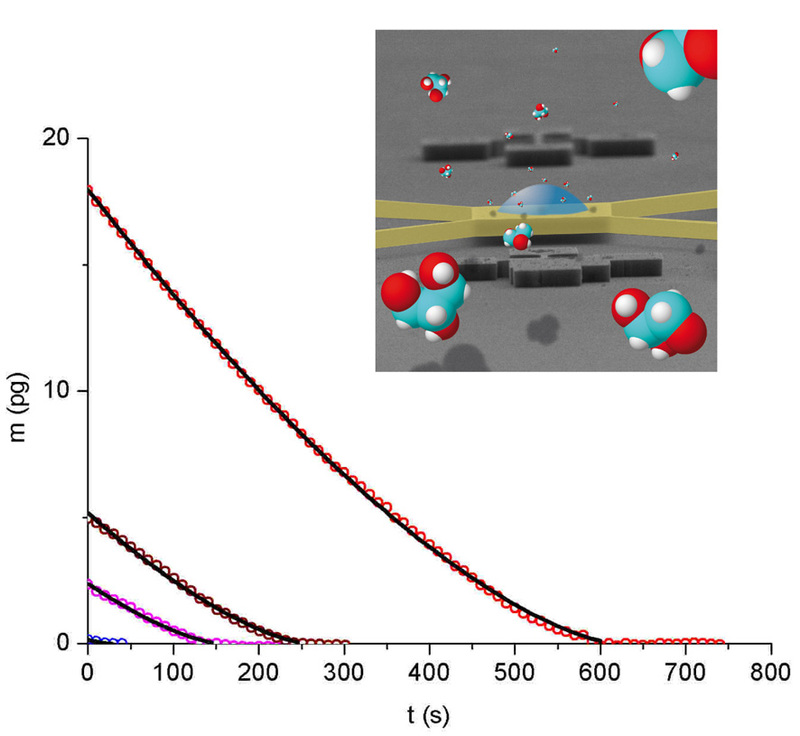 Wettability of partially suspended graphene, T. Ondarçuhu, V. Thomas, M. Nuñez, E. Dujardin, A. Rahman, C. Black, A. Checco. Sci. Rep, 6 (2016) 24237. 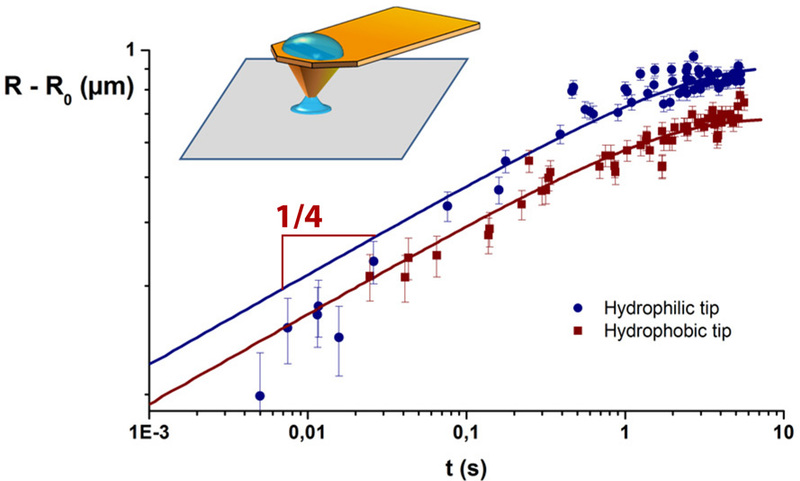 AFM study of nanohydrodynamics around micro and nanocylindersJ. Dupré de Baubigny, M. Benzaquen, C. Mortagne, C. Devailly, J. Laurent, A. Steinberger, J.-P. Salvetat, J.-P. Aimé, T. Ondarçuhu, Phys. Rev. Fluids, 1 (2016) 044104. 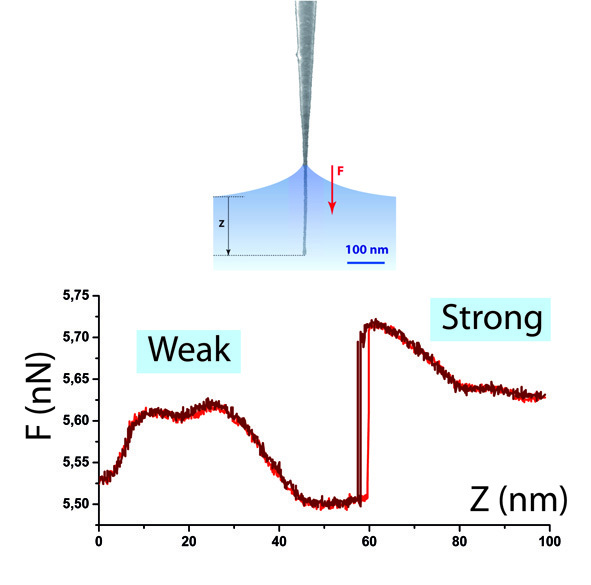 Contact angle hysteresis at the nanometer scale M. Delmas, M. Monthioux, T. Ondarçuhu* Phys. Rev. Lett. 106 (2011) 136102. The condensation of water on adsorbed viruses, J.M. Alonso, F. Tatti, A. Chuvilin, K. Mam, T. Ondarçuhu, A. Bittner, Langmuir, 29 (2013) 14580-14587. Elasto-capillary fabrication of 3D microstructures, J.W. van Honschonten, J.W. Berenschot, T. Ondarçuhu, R.G.P. Sanders, J. Sundaram, N.R. Tas, Appl. Phys. Lett. 97 (2010) 014103. Pinning of a contact line on nanometric steps during the dewetting of a terraced substrate T. Ondarçuhu, A. Piednoir NanoLett. 5 (2005) 1744-1750. Nanomeniscus mechanical properties,JP Aimé, T. Ondarçuhu, R. Boisgard, L. Fabié, M. Delmas, C. Fouché in « Nanoscale liquid interfaces », Eds T. Ondarçuhu, J.P. Aimé (Pan Stanford Publishing) 2013, 307-359 (53 pages). 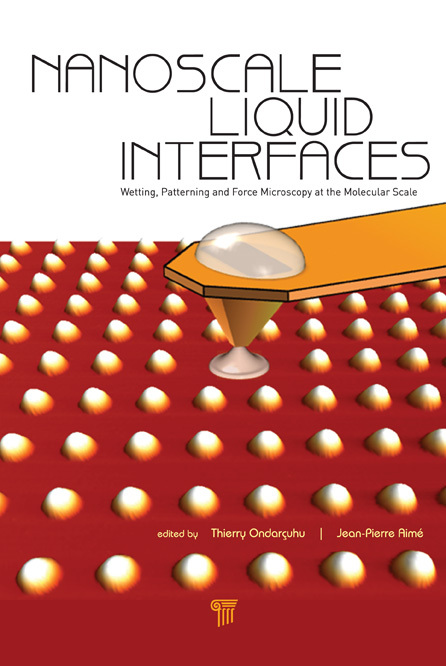 Capillary forces in atomic force microscopy and liquid nanodispensing, T. Ondarçuhu, L. Fabié, in “Surface Tension in Microsystems - Engineering Below the Capillary Length”, Ed. P. Lambert (Springer Verlag) 2013, 279-305 (27 pages). ANR "NANOFLUIDYN", European integrated project "NaPa", Cnano GSO interregion project , LABEX NEXT, TRAIN², ANR CANAC.